Last week's yard sale finds (you can see what I bought here) were great, but there were a couple of things that didn't even make it into the picture! One of my favorite finds for the week was something for my daughter. Here's how great God is: I was at Target on Friday, considering buying an extra suit for the girls for the beach, but decided against it because I was feeling super cheap. So what do I find on Saturday morning? 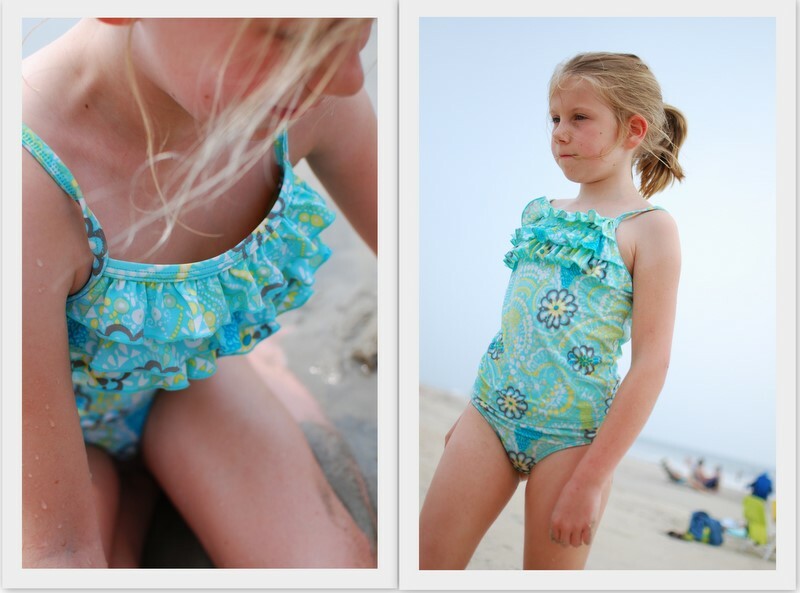 This Land's End bathing suit, just our size. It is adorable, and is in perfect condition. I love the ruffles and the sweet blue color. How much did I pay? Fifty cents. My second favorite find of the week were a pair of Fur-real pet puppies. I paid a total of $1 for both--perfect! One for each girl. As soon as we got them home, the girls whisked them away and made little shoebox beds for them. The batteries still worked and the puppies snoozed and cried and yelped. Little did I know that two little puppies was not so perfect. Apparently, I need 3 of everything now! Charlotte fell in love with the furry friends, and has not put one down since. The big girls were sad to part with one, but what baby wants, baby gets. Do you have a favorite yard sale or thrift store find to share this week? Awww, I love that line about whatever baby wants, baby gets. Too funny. The bathing suit is really pretty. I bought these beautiful vintage pitchers! http://www.farewelloffice.com/?p=63 I smiled all day! And, using your tips, I bought a few things to ebay. We'll see how that goes. thanks for the informative posts. I think my all time great price, I can use now and resell for lots later was a in the box, still wrapped in the paper basically brand new $2 Ergo (baby carrier). footy PJ's for my son (he has been begging for a pair) .25 cents. My Husband started us on casual garage saleing a few years ago. Great deals. I've sold stuff on ebay, but not from any GS finds. Now I have my eyes opened! Great blog, wonderful information and awesome pictures!! Thanks!! Aw that bathing suit is too cute! God is good! I'm taking your ebay methods and trying them out. I'm praying I do good. The completed listings really help to put pricing in perspective. Good finds, everyone! And I love all of the encouragement! You do take beautiful photos and I wanted to say thank you for reminding me that God helps us to find what we need, even if it's in the smallest ways. I lost my job almost three years ago and unemployment just ran out, so finding things to sell on ebay has been helping us make ends meet. Thank you for reminding me that God IS watching, as I sometimes forget. Thank you, Carrie. It is so neat...as I have said before, I am grateful to God every Saturday morning if I find even one thing that I need or to sell!